Eastern Standard Kitchen and Drinks in Boston is participating in the #SkipTheStraw campaign to protect the environment by saying no to plastic straws. The next drink you order at Boston-area restaurant or bar might be missing something customers are used to, but the push to get rid of it is all part of a push to protect the environment by saying no to single-use plastic straws. The campaign called #SkipTheStraw is spreading to restaurants in bars across the nation, including Eastern Standard Kitchen and Drinks in Boston. The restaurant located in Kenmore Square is open 19 hours a day and is used to going through roughly 60,000 single use plastic straws a year. Now, they have zero, only carrying reusable straws as of last week. For bar director Jackson Cannon, the last straw was hearing just how much of an impact straws have on the environment. "If we do nothing, by 2050, there will be more disposable plastic straws in the ocean than fish," Cannon said. "Let's start here." Instead of the single-use straws, Eastern Standard is serving more drinks with no straw at all, including margaritas and soda. They have metal straws for some cocktails and polypropylene straws for everything else. The polypropylene straws look similar to the disposable clear ones, but are recyclable and dishwasher safe. "It sort of startles you in the sense that it's much thicker than you expect," Jack Fetsch, a customer drinking from the new straw, said. "But my drink does not taste any different and I think the idea behind it is really solid." Cannon said the process to clean the reusable straws is similar to what they do for silverware. After soaking them in antibacterial soap, they run them through a high-temperature wash twice before a long drying process. In addition to a brief mention of the straw switch on the menu, Diego Peña, bar manager at Eastern Standard, was training the staff on how to explain it to guests at a pre-shift meeting Monday. Some of their cocktail garnishes are also changing as a result. "For example, someone who is ordering a Negroni, we will put the orange slices flat on top now," Peña said. Eastern Standard is far from the first to be sucked into the mission. The other seven restaurants in their group expect to make the switch by the end of the next month. 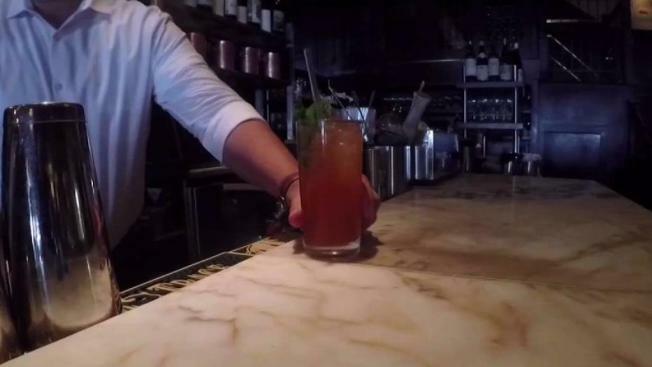 The bar director at Café ArtScience in Cambridge said they are also skipping the straw, and cities like Malibu and Seattle both voted to straw-less by this summer. An informational session about the environmental impact of straws hosted at Eastern Standard Monday was attended by bar and restaurant employees across the area. While reusable straws are far from the standard in Boston just yet, those at Eastern Standard say maybe it should be. "If Eastern Standard can do it, anyone can do it," Cannon said. "Many people are ready for this, and so the time is now."